The Automatic Talking Twister Spinner is a Project by Andrew Bedno in support of playing this wonderful game without requiring an additional person to spin the moves. Twister is the excellent all ages game by Milton Bradley, known also for its slogan "The game that ties you up in knots". 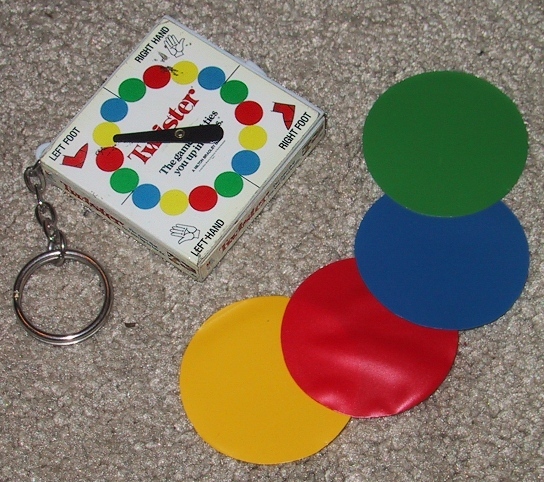 Twister is one of the top must-have core favorites in any family game collection. It is elegantly simple, uniquely physical, inexpensive, and one of the most recognizable entertainment artifacts in modern Western popular culture. For a 2-player game: Players face each other from opposite ends of the mat, one foot on yellow the other foot on blue. Optional third player starts in center of red side facing in. For a 4-player game, form 2 teams of 2 players each. Teammates standing side by side, face opponents on opposite ends of the mat. Referee spins the spinner then calls out the body part and the color that the arrow points to. All players, at the same time, must then try to follow the referee's directions. Each player must try to place the called-out body part on a vacant circle of the called-out color. Never remove your hand or foot from a circle unless you're directed to by the referee after a spin. Exception: You may lift a hand or foot to allow another hand or foot to pass by, as long as you announce it to the referee beforehand, and replace it on its circle immediately afterward. Strategy: Try moving toward an opponent's portion of the mat, forcing the player to go over or under you to place a hand or foot! Any player who falls, or touches the mat with an elbow or knee, is immediately out of the game. If you feel that a new position is impossible, or will cause you to fall, you may eliminate yourself. In a 2-player game, the game ends and the remaining player wins. In a 3-player game, the remaining two players keep playing until one player is eliminated and the remaining player wins. If there are only 2 players and no referee, you can play without using the spinner. One player calls out the body part; the other player calls out the circle color. Players alternate turns calling out the body part first. This is for reference only, don't make one yourself. If you don't already own Twister go buy one now. It's surprisingly cheap! 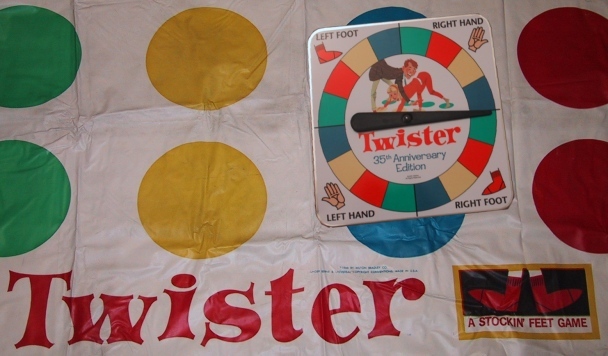 Twister (c)1986 by Milton Bradley Co. under Berne & Universal Copyright Conventions. 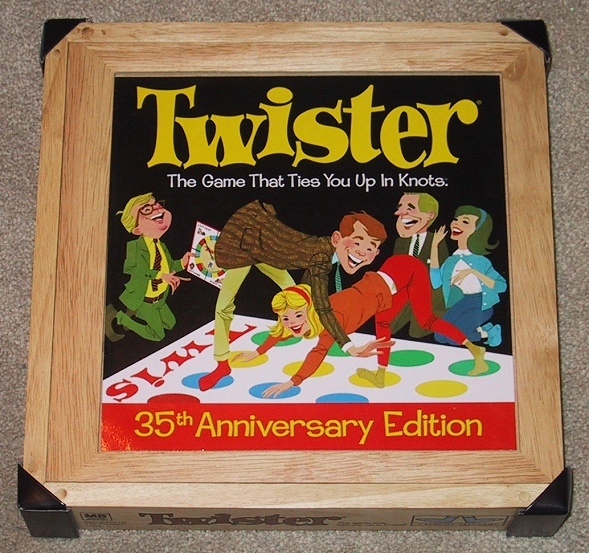 United States Patent #3,454,279 was originally issue for the game Twister on 1966-04-14, listing the inventors as Charles F. (Chuck) Foley and Neil Rabens.